Photo: Courtesy"Paradise, Our Heritage, Our Home"
When the Ferree family and others in that first group of Huguenots arrived on the land that would later become known as Paradise, they were greeted by friendly Indians who offered them shelter until they could build their own. 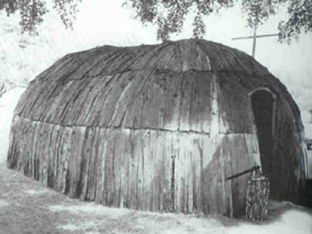 The Piquaws, as they were called, lived in wigwams like this. The first homes of the Huguenots here were shelters built of timbers with roofs of hay. They were eventually replaced with log cabins. Below is a photo (taken in July 2004) of the site believed to be the location of Marie Warenbur Ferree's cabin. If you look under the tree you can see a square indentation. 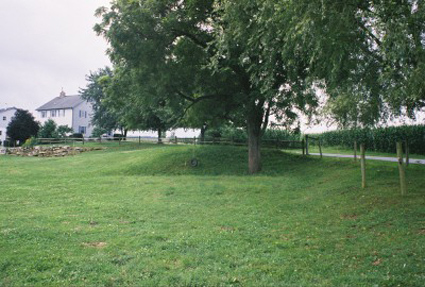 This site is located on a section of what was the farm of her son, Daniel Ferree, which he received as his part of the original land grant. A family tradition is that Daniel wished to have his mother live with his family but she chose to have a home of her own.